Domestic Terrorism: What It Is, And What It Isn't The Las Vegas shooting has again raised questions about domestic terrorism. The Patriot Act provides a definition, but because there are no actual criminal charges, some prefer not to use the term. 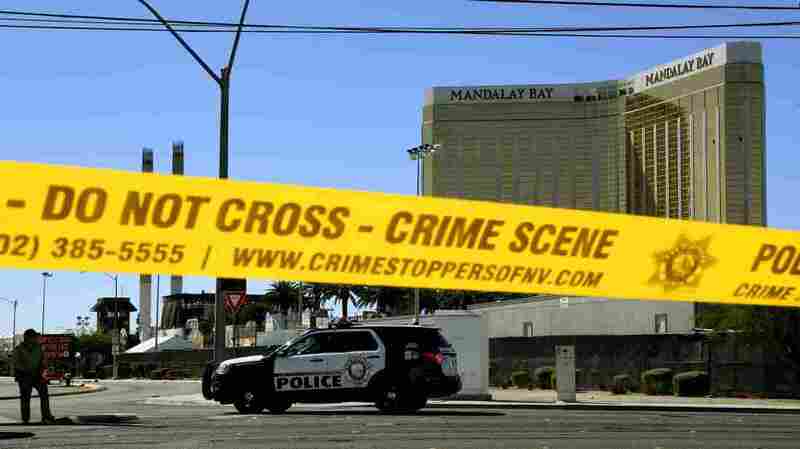 Crime scene tape surrounds the Mandalay Hotel in Las Vegas after a gunman in one of its rooms killed at least 58 people, with more than 500 others injured, when he opened fire on a country music concert late Sunday. The investigation into the Las Vegas shooting is still in the early stages, yet there already is a familiar debate about whether to call it an act of "domestic terrorism." "It was an act of pure evil," President Trump said — but the president and law enforcement officials have refrained from calling it terrorism. America woke up to a horrific nightmare. We stand with the victims, their families and the city of Las Vegas as we face this act of terror. Several members of Congress, from both parties, did describe the attack as terrorism, including Jim Cooper, a Democrat from Tennessee. Two key questions crop up every time this debate takes place. First, what was the attacker's motive? The Patriot Act defines domestic terrorism as an attempt to "intimidate or coerce a civilian population; to influence the policy of a government by intimidation or coercion; or to affect the conduct of a government by mass destruction, assassination, or kidnapping." So far, law enforcement officials say they don't have an answer on the motives of Stephen Paddock, 64. "We don't know what his belief system was at this time," said Clark County Sheriff Joe Lombardo, referring to the shooter. The second important point is that there isn't a federal charge of "domestic terrorism." The Patriot Act's definition gives the Justice Department broad authority to investigate an individual or any group a suspect might be affiliated with. But the federal law doesn't come with an actual criminal charge. To be charged with terrorism, a person has to be suspected of acting on behalf of one of nearly 60 groups that the State Department has declared a foreign terrorist organization. Some are well-known, including the Islamic State and al-Qaida, while others are far more obscure. Most, but not all, are Islamist. A person who carries out a mass attack and survives can face a range of charges, but unless the person is linked to one of the banned groups, a federal terrorism charge won't be one of them. -- Suspect James Alex Fields is accused of driving his car into a crowd in Charlottesville, Va., in August, killing a female counterprotester who came out to march against white nationalists. Fields faces state murder charges — but not terrorism. -- Dylann Roof has been convicted of and sentenced to death for a host of federal and state crimes in the shooting deaths of nine African-Americans at a Charleston, S.C., church in 2015. He said he wanted to start a race war. But terrorism wasn't among the many charges. -- Timothy McVeigh was widely described as carrying out the worst act of domestic terrorism when he killed 168 people in a 1995 bombing of a federal building in Oklahoma City. By his own admission, his motive was clearly political — he hated the federal government. Yet he was convicted of and put to death for killing federal officers and variety of other charges — but not for terrorism. The al-Qaida attacks of Sept. 11, 2001, made terrorism virtually synonymous with Islamist extremism in the minds of many. The political debate appears to be shifting, with growing numbers calling for domestic extremism to be identified as terrorism as well. But that's a political discussion, not a legal one. Legally speaking, many in law enforcement say they are wary of creating a criminal charge of domestic terrorism. They say they already have the tools to investigate and bring charges in any case involving an attempted or actual mass attack — and creating a domestic terrorism charge could quickly raise all sorts of First Amendment questions, about free speech, religion and ideology. There's one additional wrinkle to consider: Some states, including Nevada, have their own anti-terrorism laws. But those state laws tend to be invoked rarely.